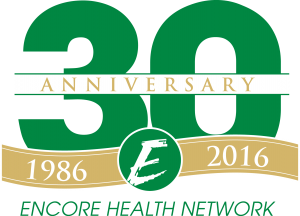 Indianapolis, IN—2016 represents the 30th year the Encore Health Network has served as a provider network to the health benefit plans of hundreds of thousands of Hoosiers. From the beginning – then known as VHA Tri-State — to today, The HealthCare Group (THCG) has prided itself in delivering value to its payer and provider business partners, and ultimately the members collectively served. These first 30 years have transpired in a rapidly-changing market which THCG has addressed with an evolving product mix from the Encore PPO, to the high-value Encircle Network, Encore Work Comp PPO, and a variety of unique individual payer and provider collaborations. “In this 30th anniversary year, it seems fitting that our theme for the celebration campaign is ‘30 and 30,’ with the slogan ‘Emerge, Evolve, Excel,’ said Bruce Smiley, president, The Healthcare Group. “We chose the theme 30 and 30 to recognize and celebrate not only the 30-year history of hard work, challenges and success, but also in anticipation of the success and partnerships to come over the next 30 years. Emerge, Evolve, Excel is both a philosophy and a strategy that THCG has espoused and strived for under its current leadership. The average tenure of the THCG team is over 10 years with many more years of industry experience. In celebration of its 30th anniversary, THCG will host a variety of events throughout the coming year, including a charity golf outing on July 14th, and partner receptions and employee appreciation events in the fall. THCG will also have an expanded marketing campaign in which THCG promotes its 30th anniversary and product offerings to the employer benefit market. Friday, January 22nd, 2016 under Featured, News Releases.